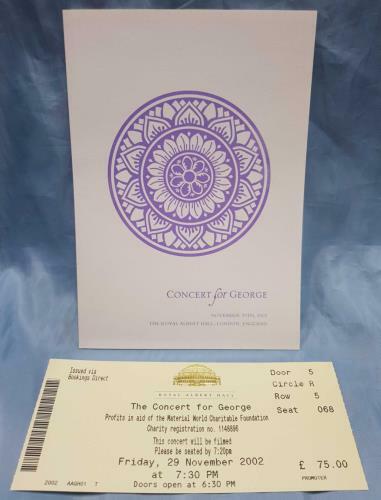 GEORGE HARRISON / VARIOUS Concert For George (Superb concert programme for the event held at The Royal Albert Hall, London on the 29th November 2002 - the first anniversary of George's death. The programme features several beautifully presented photographs of George and many quotes. 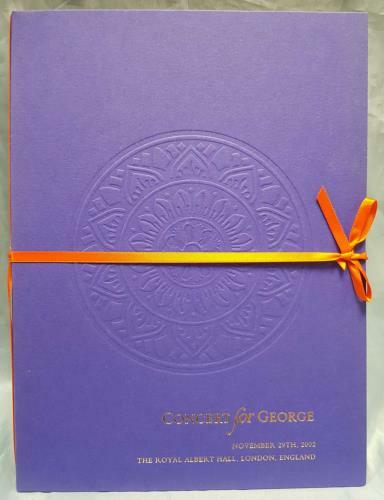 It measures 10" x 7" with embossed purple cover, gold titles and an orange ribbon tie. A stunning high-quality piece of memorabilia, complete with the original fold out schedule of events with full listof artists appearing, along with a ticket stub from the show).